Dominic Molon. Photo by Lisa Predko. Within the St. Louis contemporary art community, the Contemporary Art Museum St. Louis (CAMSTL) holds a unique position as a significant, non-collecting institution that has been responsible for some of the most exciting projects in the region. A shift in Curators always raises eyebrows and interests, suggesting new directions for the exhibition program and the broader role of the institution in the community. 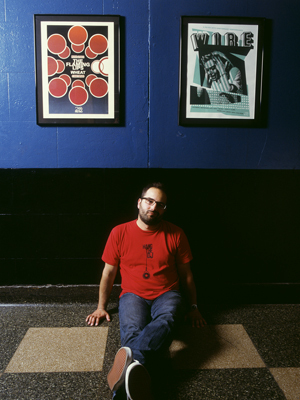 I recently sat down at the Scottish Arms for a conversation with Dominic Molon, the newly installed Chief Curator at CAMSTL, to discuss his recent move from the Museum of Contemporary Art in Chicago (MCA), the mythology that develops around curators and, of course, the Velvet Underground. 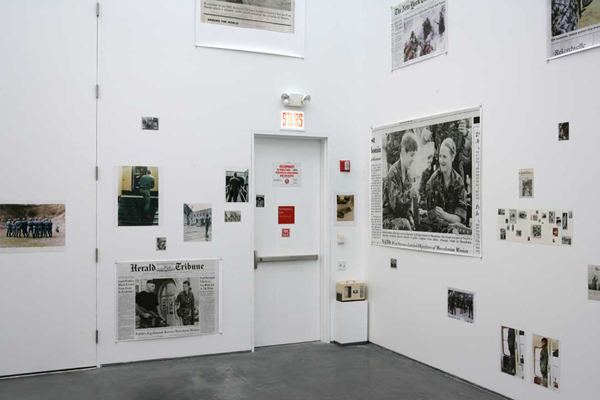 James McAnally: Your reputation as a curator seems to be dominated by your more populist exhibitions, such as Sympathy for the Devil, and the mythology of your personal narrative (starting at the MCA as a security guard, etc). Is this something you are comfortable with?Dominic Molon: I’m comfortable with the narrative as it’s the truth as to how I initially got started working in museums! I had initially planned to study communications and become a rock radio disc-jockey, but I saw an Anselm Kiefer exhibition at the Art Institute of Chicago and was really blown away. After that, I knew I wanted to work in a museum and became an art history major at the University of Illinois at Chicago. A friend mentioned that the MCA was hiring and I got a job as a security guard. Having the opportunity to see behind the scenes of the museum environment gave me a great understanding of how museums work but also how the audience interacts with art. I also became an intern in the MCA’s curatorial department before going to grad school at the State University of New York at Stony Brook to get my Masters’ degree in Art History and Criticism. I did an internship in the curatorial department at the Guggenheim in the summer of 1993, but knew I wanted to come back to Chicago after completing my studies. I joined the MCA staff again as a curatorial assistant in 1994 and worked my way up from there. As a curator, one wants to present oneself as a serious academic, but still maintain the communication with an audience. The exhibition devoted to rock music (Sympathy for the Devil: Art and Rock and Roll Since 1967) was more about my snobby taste in rock n roll (laughs) than any desire to be “populist” by presenting a familiar subject. In other words, that exhibition dealt with an inherently “popular” phenomenon but featured content that emphasized the more obscure, unconventional, and experimental examples of rock music. JM: In what ways have you approached this process working primarily in the Midwest? DM: It is imperative to show progressive contemporary work in these Midwest communities, particularly artists with political contexts outside of ours. Working in St. Louis presents a more interesting challenge to demonstrate contemporary art’s relevance and find ways to make it relevant. I find it a refreshing place to work, but there is always the question of how to make the public aware. How you communicate with who is there. There is a sense of fait accompli in places like New York or LA that you don’t feel as much here. I am still getting used to the city, exploring the curiosities in neighborhoods. I don’t have a full grasp of what the community needs yet. JM: Leaving a position always feels unfinished. Were there any projects that you wanted to present at MCA but never had a chance? DM: I had wanted to present a show with Paulina Olowska, a Polish artist with previous ties to Chicago from her time at the School of the Art Institute. Much of her subject matter arises from her exploring the tension between suppression and creativity that exemplified culture in Poland under the communist regime. Given the strong Polish population in Chicago, I think it would have been an interesting perspective to present. I also had wanted to curate an exhibition chronicling the history of European Conceptualism. There’s been a more resolved historicizing of Conceptual Art as it developed in America, yet there’s still an insufficient understanding in the United States about how it developed in Europe. JM: What kinds of programming are you interested in bringing to CAMSTL? DM: In many ways this will be determined by my getting a more complete sense of how the institution relates to the city of St. Louis. I’d like to let the character of the city seep into my own sense of what to program so as to be reflected in the program. I think we need to create more major and meaningful shows with artists of color. I am also fascinated by Route 66 as a possible touchstone for an exhibition about larger considerations of the American road/landscape in the work of contemporary artists from around the world. In making the drive from Chicago to St. Louis so frequently over the past several months and Mapquesting directions in the city, I kept noticing the “Historic Route 66” on signs, on billboards and even in directions I’d get from Mapquest or GoogleMaps and began thinking about how we’ve sustained this relationship with a highway that was made irrelevant by the Interstate system. The continuing presence of phenomena connected to Route 66 – themed restaurants, roadside museums, and so on – speak to the enduring resonance and mythical status of this American icon. We shouldn’t forget that St. Louis native Chuck Berry popularized the song! My first exhibition will be a presentation of the work of David Noonan, an Australian artist based in London who I’ve known since 2004 and whose work I’ve follows since then. We connected through conversations about film and particularly music and I’d say anything I know about Folk music, I owe to David. 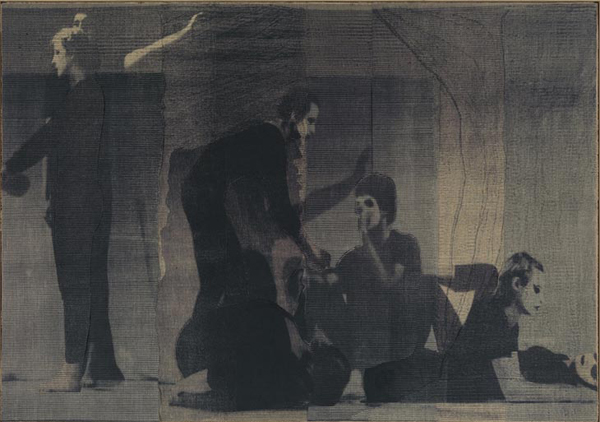 While his early work drew upon imagery of utopian collectives and cults from the 1960s and 1970s, his more recent work explores the impulse towards theatricality and masquerade in art and culture (whether experimental theater, the teaching of theatrical studies in school, or the way that phenomena like glam rock, etc. celebrated the “theatrical.”) His large-scale silkscreen works feature a very materialistic use of images, through their transfer onto layered fabrics, to reflect on how we come to understand history now largely through various presentations of the photographic image.I think a consistent thread in these shows is a fascination with popular culture that was really exemplified in the Sympathy for the Devil exhibition. That exhibition used 1967 as a starting point from which to explore the relationship between supposedly “low” rock and “high” art cultures. I chose 1967 as that was the date that seemed to recommend itself as being when rock established itself as a ‘serious’ art form. For some this happened with the release of The Beatles’ Sergeant Pepper’s Lonely Hearts Club Band LP but 1967 is also the year that the Andy Warhol-produced The Velvet Underground and Nico album was released. It was interesting that the exhibition happened at a time during which one could argue that rock was losing its relevance as the “dominant” pop musical phenomenon (conceding this to rap/hip-hop.) At the end of one lecture about the exhibition that I presented at a university, a student asked if the show addressed the move of music from something experienced through objects to the exchange of culture through digital means. The show didn’t address that per se, but maybe it formed part of a sensibility that suggests that rock needs to die. Maybe I put it in a museum in order to help it along. (laughs) Perhaps the more positive way to frame it is that rock needs more risks taken within it (like those taken by the figures celebrated in the show) in order to reestablish its relevance. Or maybe I’m just getting old. JM: You brought up that you feel there is an imperative to show progressive work in the Midwest, particularly artists with political contexts outside of ours. What exhibitions have you organized that best respond to this? Could you expand on why you feel it is important? DM: I would suggest that the Wolfgang Tillmans and Liam Gillick exhibitions represented this imperative. Wolfgang in a very personal way articulates a very strong political sensibility and sense of advocacy. Liam in a much more intellectual way engages a sensibility that is heavily informed by European political theoretical dialogue and exigencies. I think it’s important to not only present these perspectives here in the Midwest but to do so in a manner that both retains their complexity and sophistication but also helps to interpret the meaning and intentionality (which can sometimes seem a bit hermetic in some artists’ work). 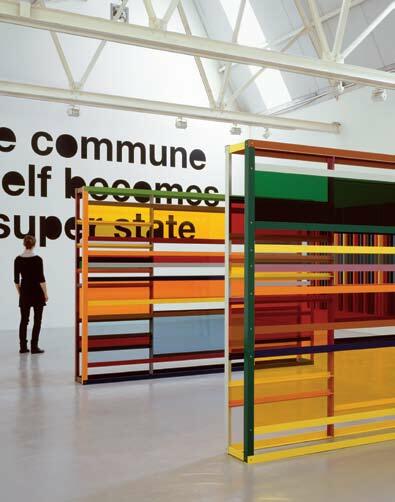 Liam Gillick. "Commune Itself as a Super State" Galerie Micheline Szwajcer, Antwerp. JM: You touched on this a bit, but what is the commission of an institution such as CAMSTL within a local community? How does it interact with the more established art communities nationally and internationally? How should it?DM: I think CAMSTL needs to be the place in St. Louis that can be relied upon to keep people here current and informed about the most compelling and relevant work being made internationally. We also have a role to play in making significant and prescient contributions to contemporary art history through the development of exhibitions that provide valuable new insights into the work of both established and underappreciated historical figures. I’d like to enhance and expand our interpretation of contemporary art for the St. Louis audience to allow it to become more accessible while preserving the complexity and integrity of the work. I think we also function a bit differently than other institutions here by providing opportunities for the work of St. Louis-based artists to be presented alongside their national and international peers. JM: Following up on a question from a recent interview before the move, how does it feel to work outside an ‘art center’? DM: It feels great and perhaps a bit more urgent, despite not having the kind of print and other critical resources on hand to provide the kind of visibility and feedback that one expects in places like New York, Los Angeles, and Chicago. It means that what we do is that much more necessary, especially in a country as vast as the United States, by providing opportunities for people who might not be able to travel frequently—if at all—to places like those mentioned above (never mind Berlin, Brussels, or London). I think it’s also more interesting to create a sense of cultural exchange by introducing international artists to a part of the United States that they might not be at all familiar with. The most critical thing is to never, ever take an apologetic or defensive stance or tone. I’ve found the art production and presentation and many other cultural entities here to be extremely sophisticated in a way that feels very relevant in general and totally appropriate to this context.